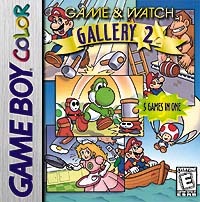 Game & Watch Gallery 2 is the sequel to Game & Watch Gallery. It was developed by Nintendo and released in 1998 as a launch title for the Game Boy Color. Parachute: Mario must catch Toad, baby Yoshi and Donkey Kong Jr. as they float down the screen with their parachutes. Chef: Peach must flip different food items with her pan and allow and feed them to Yoshi. Donkey Kong: A remake of the Game & Watch version of the Donkey Kong arcade game. Peach substitutes for Pauline in the remake version, though Pauline still appears in the original. Ball: Mario must juggle various objects. This game must be unlocked. Helmet: Mario (Wario if you get three misses) must walk across the screen, dodging various falling tools. Vermin: Yoshi must protect six eggs from predatory Koopa Troopas, Shyguys and Boos. This page was last edited on 26 August 2016, at 21:19. This page has been accessed 7,787 times.